Found a Consultation report on the planning portal called: Appendix 2 MOD response Appendix_2_20170626_MOD_Response.doc. Thank you for consulting Defence Infrastructure Organisation (DIO) on the above proposed development. This application relates to a site outside of Ministry of Defence (MOD) statutory safeguarding areas. We can therefore confirm that the MOD has no safeguarding objections to this proposal. In the interests of air safety, the MOD requests that the structure is fitted with aviation warning lighting. Any tall structure should be fitted with a minimum intensity 25 candela omni directional flashing red light or equivalent infra-red light fitted at the highest practicable point of the structure. a. Precise location of development. b. Date of commencement of construction. c. Date of completion of construction. d. The height above ground level of the tallest structure. e. The maximum extension height of any construction equipment. I trust this adequately explains our position on this matter, however should you have any questions regarding this matter please do not hesitate to contact me. Thank you for responding to our inquiries and for the call earlier today. Please find attached the amended route for the ziplines. This takes the highest point of the wire over the lake from 150m down to 135.12m falling to 75.93m at the east side of the lake. The tallest built structure in the scheme will be at 8m above the ground, similar to the Titan launch at Zipworld in Wales pictured below. I look forward to your response and please don't hesitate to contact me if you require any further information. Meanwhile, back in the real world, there is possibly a difference between one note to the planners from April on the back of an old OS map cover and 1000s of people taking the time to write and object. I found a tatty old book written by someone called Alfred Wainwright, who is he anyway? Here is a pic of the author on top of Raven Crag. 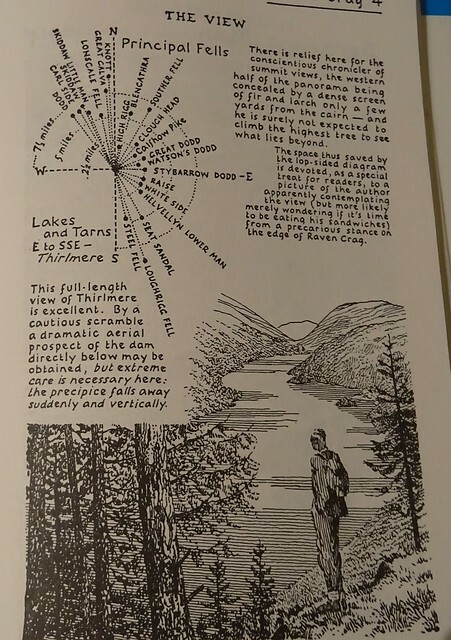 Have a look at Raven Crag 4 in the Central Lakes book. I photocopied the page and wrote my reply on the reverse Wainwright shows the view, why would anyone need to mention it? Hi April - I will do. The last protest rally I went to was in 1985, and mainly consisted of shouting "Organise, occupy, kick the Tories out" and being watched very closely by the riot police. I assume next weekend will be more tranquil. I assume next weekend will be more tranquil. Heard on the grapevine today. The RAF have officially today put in an objection to this project. Now that may carry some severe weight. Hopefully. It is great news Addingham, the MOD letter was circulated last Thursday 18/1/18 - see the posts on this thread from post 195 - 210. I can't see how the LDNPA could possibly approve this application even without the MOD objection but now it seems that it can't be approved. Mike Turner hopefully will have time on his hands this year when the Zip Plan is refused. I think he will do very well in a certain competition held in Wasdale every year. Mike Turnip hopefully will have time on his hands this year when the Zip Plan is refused. I think he will do very well in a certain competition held in Wasdale every year. For God's sake - don't allow him anywhere near Wasdale! Thanks LL, those are interesting figures, only 163 in favour! Like "Turnip", a much more suitable name. Below is a quote from Roger Smiths article in The Great Outdoors Feb 18 edition, it says it all really. I would hope that Principle is totally accepted by the LDNPA, in which case there is no need for further discussion. The zipwire scheme is clearly inappropriate and should not go ahead. If it is passed by the LDNPA then I believe those members of the LDNPA board who vote for it should be summarily dismissed and replaced by people who genuinely understand and support Sandford"